The National Committee on Uniform Traffic Control Devices might be the most influential group of American bike policy makers you’ve never heard of. The committee shapes street design standards in the United States to a large extent. Their recommendations become part of the Manual on Uniform Traffic Control Devices, a guide to street markings, signs, and signals that many professional engineers treat as gospel. The NCUTCD consists mostly of older engineers from state DOTs. In recent years, its bikeway design orthodoxy has been challenged by a new wave of engineers looking to implement treatments that the American street design establishment has frowned upon, despite a proven track record improving the safety and comfort of bicycling. Most notably, the National Association of City Transportation Officials has released guidance on the design of protected bike lanes that the MUTCD lacks. NACTO’s guidance is gaining adherents. Dozens of cities have implemented protected bike lanes in the past few years. The Federal Highway Administration endorsed the guide in 2013. All this progress doesn’t seem to sit very well with some members of the old guard. In January, the NCUTCD passed a resolution [Word file] establishing a “task force” to investigate “interest groups that may not be part of the NCUTCD” that promote street designs which don’t conform to the Manual on Uniform Traffic Control Devices. But the recent resolution is a not-so-veiled attempt to impede that flexibility. Not every member of the NCUTCD wants to hinder change. Bill Schultheiss, a consultant with Toole Design Group and a long-time member of the committee, was alarmed by the resolution. He says the structure of the committee leads to unnecessary foot-dragging. For example, Schultheiss said, before the committee moved to approve dedicated bicycle signals, it spent a year arguing about whether it would be appropriate to use red, yellow, and green colors out of fear motorists would be confused. Some members of the NCUTCD’s Bicycle Technical Committee have resisted street treatments that are now gaining wide acceptance. The chair of bicycle committee of 10 years, Richard Moeur, was a career engineer at the Arizona Department of Transportation. He keeps a blog where he raises questions about the safety of bike-specific signals. We reached out to Moeur for a comment on the resolution. But he deferred to other members of the NCUTCD. Other members have not responded to Streetsblog’s queries. Though the Association of Pedestrian and Bicycle Professionals and the League of American Bicyclists each nominate one member to NCUTCD, its composition is mainly dictated by other groups, like the Institute of Transportation Engineers and the American Association of State Highway and Transportation Officials, which each get to make eight appointments (Moeur is one of them). According to the group’s bylaws, a two-thirds majority is needed to approve recommendations, so AASHTO and ITE support is essential for changes to the MUTCD. Once members are appointed there are no term limits, leading to infrequent turnover and a dearth of younger members. Which tells us a lot about his type of cycling advocacy! His quote showed he doesn’t know enough to avoid door zones. And his skill level is so low that he’s very traffic intolerant. IOW, he’s a bicycle advocate who’s simply not competent riding a bike. How many professional fields do you know where incompetence is so acceptable? How about a driving instructor who couldn’t make a good left turn or merge onto a freeway? How about a golf pro who topped or sliced every shot he demonstrated? How about a shooting instructor who had shot off one of his fingers and two of his toes, and was still missing them narrowly? It’s a ludicrous concept; but among bike facilities advocates, if someone admits to being a competent vehicular cyclist – one who safely and comfortably rides according to the normal rules of the road for vehicle operators, AND who knows the hazards of weird new facility designs – they are treated like pariahs. About NACTO – yes, I knew exactly where it came from. “Our ideas don’t meet logical engineering standards, so we’ll make our own ‘anything goes’ standard.” It will be interesting to see if this approach is duplicated in other fields: Design manuals for making airliners out of papier mache, textbooks on adhesive joint design that recommend only bubble gum, building codes advocating dung walls, automotive engineering manuals written by good-ol’-boys who cobbled together a junkyard “monster truck”, and traffic engineering done by “planners.” It’s a brave new world, all right! John Pucher’s research was not about instructing people how to ride a bicycle or where to ride. He had an intense interest in doing research about bicycling and therefore focused on that. He also would not be considered to be in the field of bicycle advocacy. He was a professor of urban planning who did research on bicycling. The problem with vehicular cycling is that the devotees are convinced that this is THE safest and ONLY way you should ride a bicycle on a street. Thoughts of separating bicycling from motor vehicles is attacked as heresy to this insular dogmatic belief. Any research those indicates anything else is thrown out, attacked or overlooked. That keeps perpetuating this insular dogmatic viewpoint which should not be on bicycle technical boards of government agencies. There needs to be more open minded people who will take a objective look at what works or doesn’t. Most of what has been rejected at the federal level for bikeway infrastructure is not some “weird new facility design”, its mainly designs that have used successfully for decades in European countries. A architect who attended a city of Los Angeles Bicycle Advisory Committee a few years ago stated that if he only did things that are in the manual he would never get anything built. To simply follow a very limited amount of designs that are meant for a few scenarios could produce unusable results. Bikeway infrastructure that has been approved at the government level has not kept pace with what has been used successfully in countries for decades. If this slow method of approval was applied to airplane and car design then we would still be only using prop airplanes and hand crank starters on cars. Sidewalks and crosswalks place the pedestrians in a straight-ahead position to the right of right-turning motor vehicles. Your saying that this is incompetent engineering? Cycle tracks are creating a road system within a road system similar to how the sidewalks and crosswalks work for pedestrians. I know of no cycle track promoters who are fear mongering. Its the vehicular cycling devotees who are doing that. Traffic engineers in the U.S. frequently won’t use Dutch bikeway designs when there is enough money and space to implement them. Why is that? Its because those designs are not in the manuals. A good example of this is the design of the bike path that runs next to the Orange Line BRT in Los Angeles. The California Highway Design Manual states the width of the mixed use path–the engineers followed that. There were also pedestrian level lights installed. When it came to the intersection design to connect the mixed use path the engineers copied the typical design for pedestrians at intersections. Absolutely nothing was bicycle specific design at the intersections. Narrow steep ramps designed for wheelchairs. Pedestrian walk signals and manual push button activators that are placed beyond arms length from the ramp to and from the street. Even crosswalks which mixes bicycles with pedestrians. To increase the rate and safety of bicycling Los Angeles is using new parking regulation that require bicycle parking, wayfinding signs, bicycle boulevards, bike lane and sharrows. Each have a place. Sharrows are almost totally pointless on busy streets because few cyclists use them. The Los Angeles County MTA has had a ad campaign that put an ad that took up the entire space at the back of buses that stated every lane is a bike lane. The agency also placed ads that stated give bicyclist three feet when passing. There is a private company that goes to elementary schools in the LA school district and educates kids about the rules of the road. They use bicycles as part of this education. Its not at all reasonable to expect many people to choose bicycling in front of motor vehicles on a major street. That’s never going to happen. If anything its a ideology that is suppressing the amount of bicycling in this country by trying to prevent the installation of bicycle infrastructure that the majority of people have stated they need in order to bicycle on a daily basis. You are exhibiting a all or nothing attitude towards cycle tracks. If there cannot be cycle tracks installed at the quantity and quality of Amsterdam, then don’t install them at all. Or this is not Copenhagen or Amsterdam and so don’t install cycle tracks because it won’t work unless the conditions in these cities is duplicated here. In order to get more cycle tracks, there has to be more cycle tracks installed. Saying there are few of them now in the U.S. and so these should never be used, or that the design that is now used for cycle tracks is not up to the standards that the Dutch use and so they should not be installed is a obvious attempt to stop the installation of cycle tracks. Traffic engineers generally have the ability to improve the design of cycle tracks if they are allowed to do so. The Dutch improved the design of cycle tracks through several generations of improvements. The vast majority of cycling on streets is done by riding to the right of moving motor vehicles. You state that there is a very low probability that a cyclist will be killed riding on these roads. Therefore, you are also stating that cycling to the right of moving motor vehicles is very safe. Dennis, you’re flailing around, desperately trying for argument points. The education problem that needs solved is this: Most cyclists think they must not ride away from the gutter. They mistakenly think they must risk car doors, potholes, right hooks and more rather than _ever_ delaying a motorist for even a few seconds. They think this despite laws that say the opposite. And like you, they never bother to seek the instruction that would teach them otherwise. If you’re going to continue a discussion that touches in any way on vehicular cycling, you really need to read up on it. I suggest you begin by reading and studying Street Smarts, which is a brief introduction. http://www.bikexprt.com/streetsmarts/usa/index.htm Then read and study _Cyclecraft_. If you continue discussing VC without doing at least that reading, it will continue to be obvious that you’re arguing from a position of ignorance. Take heart! Ignorance can be fixed. OK, Dennis, I guess we have to review the differences between pedestrians and bicycles and how they relate to sidewalks and cycletracks. Let’s begin with speeds – 3 mph vs. (normally) 12 mph, up to 25 mph. And I know of cycletracks on roughly 5% grades where even higher speeds are possible. A turning motorist can spot a 3 mph pedestrian in plenty of time; not so a distant 20 mph cyclist. Then there’s stopping distance. A pedestrian’s stopping distance is roughly two feet, and requires only skills learned at age one. A highly skilled cyclist who’s ready and not surprised can stop in perhaps 25 feet from 20 mph, or roughly ten feet at even 12 mph. If he is surprised by a turning car or if he’s traveling downhill, his stopping distance will be much greater. The point is, any motorist should be able to spot any pedestrian in plenty of time; and if he doesn’t, the pedestrian can stop immediately. But a right turning motorist is much less likely to spot in time a bicyclist approaching at four to seven times the speed, given that the motorist has to scan way over his shoulder into his blind spot – and perhaps has to see through a van that you’ll claim is “protecting” the cycletrack. And if he doesn’t see that cyclist, the cyclist will have a much harder time stopping. How is this solved in the Netherlands? They’ve been working at replacing ordinary intersections with large, elaborate and expensive semi-roundabouts where all traffic – including cyclists – are subject to delays so only one type of vehicle moves at a time. And I’ve corresponded with other advocates who claim THAT is the only acceptably safe design. “John Pucher would not be considered to be in the field of bicycle advocacy”??? Wow. Your posts are now setting new standards for cognitive dissonance! Its well established that the vast majority of people cycling on streets are doing so by riding to the right of motor vehicles. If bike lanes are installed, then more people will likely cycle in the same position on the street as was the case before the bike lanes. You are in essence stating that riding to the right of moving motor vehicles is extremely safe since that is where the vast majority of cyclists now ride. In fact you state that the risk of a fatality is “minuscule.” Yet you keep stating that minuscule equals dangerous for those cycling to the right of motorists. The vast majority of people who are riding on the streets are doing so by riding to the right of motorists and your again emphasizing how studies have shown that it is far safer to do this than to not ride at all. Yet, you continue to claim that cycling to the right of motor vehicles is full of perilous dangers. You are again stating that riding to the right of motorists–where the vast majority of cyclists ride–is extremely safe. You stated that the risk of a fatality for bicycling is minuscule and yet you also state that deaths and serious injuries for bicyclists hitting parked car doors are common. The percentage of police reports for cycling injuries from hitting parked car doors is about 8-11% of the reported total cycling collisions and the resulting fatalities are a fraction of the overall “minuscule” cycling fatalities. Again, according to the 2013 Los Angeles County Bicycle Coalitions bicycle count report results from over 50 intersections, bicyclists tend to prefer riding on dedicated facilities compared to streets with no bicycle facilities. Sharrows are correlated with 22% more ridership, bike lanes 86% more ridership and bike paths 391% more ridership. Signed bike routes with no painted markings are not correlated with increased bicycling. Make more attractive places to bicycle away from the stress imposed by motor vehicles that are a fast, direct way to go somewhere and more people will bicycle. What streets are most transit users, motorists, pedestrians and cyclists traveling on? The answer is simple, arterial streets and not residential streets. Dennis – You musta missed all those Metro buss with “Every Lane is a Bike Lane!” taking up the entire back end. I haven’t been shouted at in LA since they appeared. Think about it – that ad campaign was the end of the “get out of my way, I’m in a car and you’re not” car driver attitude on all streets of the city. BTW- I ride in on the right 1/3 margin in most streets – no issues with traffic, dooring, or right hooks (I have enough space & time to stop). Seems like the sweet spot for my line of travel in Los Angles traffic. You mileage and success may vary in other places. PPS: Gotta post on this giant thread somewhere – looks like a colossal battle! Dennis, will you _please_ try to learn something about vehicular cycling, so you’ll at least understand the basic concepts? You’re engaging in trivial wordplay, asking me waste time typing things that are well explained in print, or covered in about the first hour of any decent cycling class! Yes, cycling is very safe. Americans do at least 10 million miles between fatalities, even though half of all car-bike crashes are caused by incompetence of the bicyclists. So there’s no reason to scare people into thinking that a cycle track is the only safe place to ride! And riding on the right is very safe, too, _under the proper conditions_. So when there’s a parked car, it’s _not_ smart to ride within reach of the door. Dooring comprises up to 25% of the car-bike crashes in some cities. Are you really trying to tell people it’s just fine to ride within reach of car doors? It’s fine to ride to the right in a wide enough lane. (14 feet is often given as a minimum, although some riders accept less.) But in a 10 foot lane, it’s foolish for a two-foot-wide cyclist to share that lane with a 6.5 foot wide car, let alone an 8 foot wide SUV. That leaves only inches of passing clearance, and gives the cyclist nowhere to go if a pothole appears. Most bicyclists don’t know these facts, because like you, they’ve never taken the trouble to learn. Like you, they think they already know all about riding a bike. And like you, they think that if there’s information on a better way than what they “know,” that information must absolutely be wrong. Still, absent parked cars, intersections and driveways and motorists that want to enter or leave them, riding on the right in a wide lane is fine. Why? Because in that situation, there are no hazards from crossing conflicts, and there’s no visual clutter from parked cars. The cyclist is visible and given attention by the driver. But you want to put the cyclist out of sight, behind parked cars. You want him to be entering intersections at places where vehicles do not normally appear. You pretend that because zero-speed pedestrians cross there, that it’s fine for a 20 mph cyclist. It’s not! It’s a recipe for surprising motorists, which is never a good idea. Traffic engineers don’t want to design in surprises (like straight-ahead vehicles appearing in the path of right-turning vehicles). Really, how does this make sense to you? Why is it never done for motor vehicles? It’s not even done in the best Dutch designs. Instead, they prefer conflict-free intersections, where phase separation and lots of extra room enable cars to wait while bikes get their own green, etc. Some European designers say that’s the only way to make a cycletrack intersection safe. But of course, you’re not lobbying for those designs, are you? America is not going to magically become Amsterdam any time soon. In fact, that’s never going to happen at all. and see if you can learn something? Even if you never use these techniques at all (because you “know better”), you’ll at least understand what you’re arguing against. The only people that I’m aware of who are responding on this thread that there is only one place to safely ride along a major corridor is the vehicular cycling advocates. Who has stated that cycle tracks are the only safe places to ride? The scare tactics all seem to be coming from the vehicular cycling followers. Since the vast majority of people ride to the right of motor vehicles, your statements make it quite clear that riding in that manner is extremely safe. Then you go on to describe how most people ride is very dangerous–the complete opposite of your statements that cycling is extremely safe. I must also add that up to 100% of passengers in airplane crashes die. Think about that if you dare get on a airplane. It’s that good enough fear mongering? Perhaps not, you seem to be better at this than I am. Now you’ve attacked the intelligence of most people who ride a bicycle on a street since that is where they ride. Only the smart people ride in front of high speed motor vehicles evidently. Actually I’ve spent years directly people to ride that way by waving flags used on aircraft carriers during the day and flashlights at night. I believe this has met with quite a lot of success as the vast majority of people ride in this position across this country. Or perhaps that was all a waste since most people tend to ride in that manner anyway. Wait, you’ve got some more fear mongering to share. At 6:37 in this video of a Cycling Savvy course there is a car which is moving around a curve and closing in on a Cycling Savvy instructor at a high rate of speed from behind. The video is stopped and no mention is made that this was a close encounter. Most people would almost certainly say that was a close call and a very stressful place to ride a bike. To a vehicular cycling devotee it would probably be a great example of the bicyclist using their magic arm to control the situation. How omnipotent of you to decide that its alright to ride to the right of traffic if there is absolutely no cross traffic. After you have declared that bicycling is extremely safe. I’m sure glad you made that insightful observation. The U.S. was also not going to become Japan in the 1970’s and so the U.S. car manufacturers should have stopped trying to improve the quality of their cars and just stuck with that 1970’s quality they had. After all, Japan had a different culture and work ethic. The types of quality improvements that they obtained could never be employed in the U.S. The first pedestrian street in Copenhagen was built in 1962. It was one of the first pedestrian schemes in Europe. This caused a furious public debate. Comments that it wouldn’t work in Denmark. We are Danes, we’re not Italians. We will not come out. We will not walk. We have no tradition for urban life and all the businesses will go broke. There was enormous resistance from the shops. In the early 1970’s, the city of Groningen in the Netherlands decided to remove parking on a street. The businesses said that they would have to immediately leave, it would never work. They didn’t leave, the businesses did much better after the parking was removed. Then New York City Transportation Commissioner Janette Sadik-Khan told Mayor Bloomberg that she wanted to close Times Square to cars and make a pedestrian plaza. He thought it was the most idiotic idea that he had ever heard. After she talked to him for ten minutes, he decided to let her go ahead on a temporary experimental basis. If it didn’t work it would be removed. Its still there. In fact there are 70 plazas in NYC now and 35 miles of cycle tracks. Los Angeles is making a cycle track next month on Reseda Blvd. To do this they will have to remove parking on one side of the street. Hey, that won’t work, we’re not Amsterdam or Copenhagen! I’m astonished that you thought the passing maneuver at 6:37 in that video was a “close encounter”! The clearance between car and bike was probably eight feet! It’s more than a cyclist would get in many of the cycle tracks you espouse, even on straight stretches. Clearly, you’ve got a serious phobia about riding anywhere near cars. To avoid ever inconveniencing motorists, you’re even advocating riding in door zones – something even NACTO warns against! – and you’re attacking any other advice on competent cycling as fear mongering. Are you also against driving school instruction before kids get driver’s licenses? After all, those instructors also teach about roadway positioning, hazards of crossing traffic, causes of crashes and so forth. Should they, too, be labeled fear mongers, and should teenagers be just figuring out how to drive all on their own? Dennis, you’re obviously so fearful about riding a bike that for you, it _may_ be dangerous. I’m not talking so much about crashes, although I wouldn’t be surprised if you do crash often based on your statements – assuming you actually ride a bike. No, I’m talking about stress. For someone as fearful as you, heart attacks and strokes are real possibilities. Heck, I doubt you handle the stress of driving very well. Better stick to a nice, safe bus ride – while wearing a crash helmet! The motor vehicle I mentioned was not the jeep which passed on the right of the bicycling instructor, it was the black car which came up directly behind the bike rider at a high rate of speed just after the jeep passed. The motorist slowed down with barely enough time before it would have hit the bicyclist. This can be seen at 6:40 minutes into the video. The motion in the video is stopped to perhaps gloss over the situation to the viewer. Your probably thinking, oh, that didn’t just happen, the bicycle rider was in complete control by simply raising a arm to slow down the driver. The motorist wasn’t actually the person controlling the steering wheel, accelerator and brake pedals. Nope, it was the bicycle rider. Your never going to convince many people that a 3000 pound motor vehicle traveling at a high rate of speed has no possibility of hitting you when your directly in front of its line of travel. Most people have more common sense than that and would try to avoid putting themselves in situations where that could occur. Those videos are providing loads of scenarios where most people would never ride a bicycle. That course is trying to convince people to ride where the traffic would create the most stress for them. Which would be a very unpleasant experience for the vast majority of people. These are not attractive places to ride a bicycle. Most people would rather be in a car than put themselves in stressful situations riding a bicycle. Your beating a dead horse on that. Most people have choices for the types of transportation that they can use. If its not fast, convenient and comfortable to bicycle to a place they need to get to, then they will choose another form of transportation. I don’t have a phobia, nor am I fearful or under a lot of stress riding anywhere near cars. I do this on a regular basis. Most of my trips are done by riding a bicycle at least part of the way. I also mainly ride on busy arterial streets day and night. Depending on the situation I might ride on a sidewalk part of the way. move next to the curb and proceed through the intersection after exiting a right turn only lane. I might also take the lane. I ride in bike lanes that are in the so-called door zone. I also ride in about the same position where there are no bike lanes and I ride a lot on mixed use paths. Pedestrians on the path, not a problem. I’ve come across horses on the mixed use paths. That also was not a big problem. 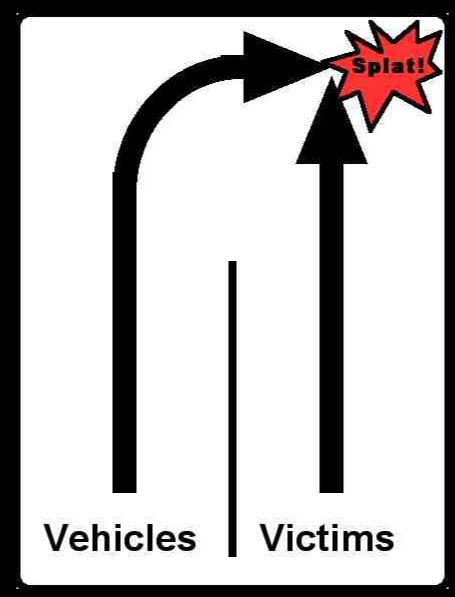 Motor vehicles making right turns. I deal with that situation every day and it works smoothly. I look around me when passing driveways or going through intersections. I don’t assume motorists will not make mistakes. Your way over-blowing the risk of riding a bicycle. Its a multitude of possibilities, but I will try to stay away from motor vehicles due to the mass and speed differential. I don’t have a safety cell to protect me on a bicycle in a fender bender like car occupants do. I’ve done this for tens of thousands of miles and avoided incidents by paying attention. I don’t assume that the motorist will not hit me because of some rule of the road. I don’t put myself in front of fast moving motor vehicles unnecessarily. That’s more likely to agitate them and perhaps provoke aggressive behavior towards me. The most serious injuries and most fatalities for cycling come from collisions with motor vehicles. Higher speed collisions are more likely to cause serious injury or death for a cyclist. I try to avoid the situations where that may occur. I don’t just focus on what might occur riding to the right of motor vehicles, I also evaluate what could occur by getting in front of them. Your focused almost entirely on what might occur riding to the right of motor vehicles and you overlook what could happen when riding in front of motor vehicles. That’s a very distorted and lopsided way of looking at safety. On what page of a NACTO guide does it state to not ride in the so called door-zone? Its a waste of time to advocate for people to ride in the so called door-zone because that’s where most of them will ride anyway. With or without bike lanes the great majority of people that ride will do so in the door zone area. Installing bike lanes is not convincing people to ride where they don’t want to ride. Its giving people a sense of separation from moving motor vehicles on busy streets that is enough for about 7% of the adult population to ride. Want more people to ride? Then provide a greater sense of separation by providing some sort of physical barrier between them and the moving motor vehicles. Also move them further away from the parked vehicles by providing more separation between the moving vehicles and the parked vehicles. Telling people to position themselves in front of fast moving vehicles is going nowhere in terms of convincing many of them to do that. Its literally keeping the volume of bicycling down by fighting the installation of separated bicycling facilities. There is never going to be a bicycle training course taught in public schools where they teach kids that the proper way to ride is directly in front of fast moving motor vehicles. That’s never going to happen. I’m not having frequent incidents of crashes riding my bicycle to the right of motorists as you keep claiming will almost certainly occur. Two of the biggest collisions that I’ve ever had were when motorists hit me from behind while I was riding in the middle of a through motor vehicle lane. I try to use defense riding where the odds of that happening is lessened by not putting myself in the position where that could possibly occur. Homogeneity of mass, speed and direction is common sense for safety and one of the five safety principles that the Dutch engineers use in designing roadways. Its also important to have forgiveness of the environment for both physical and social safety. Putting people in stressful traffic is not a physical safety improvement, nor a social safety improvement. Vehicular cycling is not scalable. Three surveys that consisted of adult participants had less than 1% of respondents indicating that they would be willing to ride on a busy street in mixed traffic. Few of them would ride in front of fast moving traffic. A small portion of those would ever be willing to ride in front of motor vehicles on a busy street. There’s zero possibility that vehicular cycling will be taught in public schools on a large scale. Administrators are not going to allow their students to learn to ride in front of motor vehicles on a busy streets. Your beating a dead horse on this, its not going anywhere after 40 years of trying. The horse is still dead. Over ninety-nine percent of adults surveyed would not be willing to ride a bicycle in mixed traffic on a busy street because they consider that too stressful and most of all dangerous. They would much rather sit encased in the safety cell and comfort of a motor vehicle than ride a bicycle in mixed traffic on a busy street. Your trying to convince these less than 1% that its riding to the right of motor vehicles that produces those problems, that riding directly in front of fast moving motor vehicles is the safest way to travel on these streets. This has met with only a tiny minuscule of those people becoming believers in that philosophy. Its an idea that has almost no appeal to a mainstream audience. The vehicular cycling devotees want to go beyond that by trying to be the gate keepers of who gets to ride on busy streets. They are trying to block the installation of most separate bicycling facilities on these streets and therefore limiting who would be willing to ride a bicycle there. VC advocates go around to blogs slamming separation on busy streets as dangerous. Those that are willing to ride with no separation on busy streets who don’t follow the vehicular cycling methods are attacked as incompetent, frightened worriers, and not very bright cyclists. Regarding the video: So you’re talking about the car that was shown from 6:40, when it approached, to 6:54, after the motorist had slowed down, stayed behind the rider, then passed calmly as the cyclist completed her move to the left on that one-way street, which (although not shown) was probably for a left turn. Obviously, what she did worked. I understand you’d be afraid of making that move. Fine. Since I’ve taken that class and others, I know those classes always give you alternatives – probably to ride on the right, then stop at the curb and wait until it’s completely clear before crossing to the left. That alternative is a standard part of vehicular cycling education. Now tell us: What would the cycletrack solution be? How would you redesign that intersection to allow cyclists with absolutely no training, age 8 to 80, to make a left turn there? What would that cycletrack installation – along with (I assume) traffic lights for phase separation – cost? And how would you sell it to cash-strapped road departments and taxpayers? Then what about adding cycle tracks at the locations shown at 6:13, and 9:26, and 9:46, and 10:00, and 10:26, and 20:57, and 21:10, and 21:30? How soon do you think you’ll be able to get all those installed? And what should cyclists do in the mean time? Wait for a bus? What the class did was teach those cyclists to ride in those locations (and countless others ) _right now_. And contrary to your paranoia, it’s not a fearsome thing. The techniques work, and one obviously doesn’t have to be a macho bike racer to employ them. Watch the videos of the participants to see who they were and their reactions. So tell us: those were two of exactly how many collisions with motor vehicles? Can you give us details on those, plus the rest of your bike-car crashes? I’m curious about all of them. We can trade details of our car-bike crashes, if you’ll go first. But don’t omit any, please. I don’t know what surveys you’re referring to, but I do know that survey responses are very heavily influenced by the phrasing of questions. For example, you repeatedly use the phrase “in front of high speed motor vehicles,” as if the sole environment for vehicular cycling is on a crowded urban freeway. I’m sure a segregation fan can construct a scary sounding question using that phrase and get precisely the answers desired. 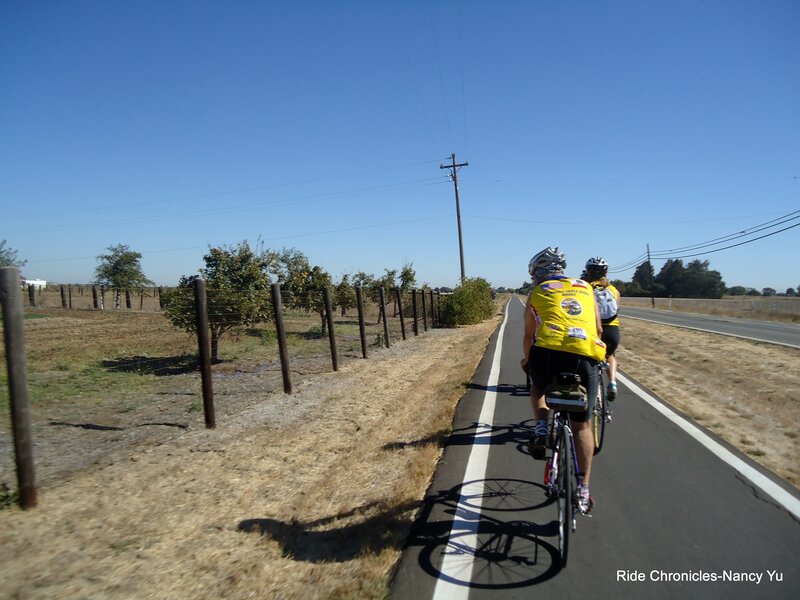 In real life, cyclists who learn how to ride as legal vehicle operators often begin with quieter roads, increasing their range of choices as they realize their former fears are overblown. It’s the same process that happens with beginning car drivers. By contrast, those cyclists who haul their bikes to back-and-forth bike paths never do progress. They never use their bikes for anything practical, because they remain addicted to segregation. They experience a very limited version of cycling. But speaking of “scalable”: What percentage of American streets and highways do you expect to have cycle tracks in ten years, to allow those timid souls to get around town? How about in 40 years? Care to give us your estimate? Feel free to give the same estimates for just LA, if you like. I keep wondering how soon your miracle transformation of America will take place. Its not obvious that what the cycling instructor did stopped the motorist from plowing into them. What’s obvious is that the motorist stopped their car from hitting the cycling instructor by pressing on the brake pedal. There should be no question that if the motorist did not react in time he/she would have smashed their car into the cyclist. A person cycling in front of motor vehicles has very little control over the reaction time and judgement that motorists make. How do you know for sure whether the motorist was calmly passing the cyclist? A motorist frequently uses their horn to indicate their displeasure at something. There was no sound from the street in that video. The motorist could have been thinking that they almost hit the cyclist and that the cyclist was foolish and an idiot for riding like that. All we get to see is the cycling instructor waving at the motorist. That’s not indicative of how the motorist may be feeling about what occurred. “I understand you’d be afraid of making that move.” Your obviously not understanding much of anything about me. Although you do have a habit of jumping to conclusions. I usually wouldn’t do that maneuver because in almost all circumstances it would be unnecessary to expose myself to the movement of high speed motor vehicles like that. I avoid that situation by choice. There is almost always a alternative that I would choose over that. “How would you redesign that intersection to allow cyclists with absolutely no training, age 8 to 80, to make a left turn there?” To get ages 8 to 80 to ride alongside a busy street there would have to be a barrier separating them from fast moving vehicles. Everything else that has been tried has not been successful in attracting the demographics of ages 8 to 80 to ride along busy corridors. That would include sharrows, striped bike lanes and vehicular cycling. The majority of the population has shown an unwillingness to ride a bicycle where fast moving motor vehicles can easily invade the cyclists space. Those cities with the greatest amount of cycle tracks tend to have the largest amount of the population bicycling on a daily basis. Its pretty clear what it would take to get more than 7-8% of the population riding daily and that’s start building cycle tracks. To keep the commuting rate for cycling below 1%, don’t install separation for bicyclists on major streets where most people need to go to get somewhere. There were 14 U.S. cities in 2006 that had cycle tracks. By 2014, the number of cities with cycle tracks had grown to 61. The first parking protected bike lane was installed in New York City in 2007. Most of those cycle tracks in the U.S. installed since then have been parking protected. Up until about four years ago the California Highway Design Manual prohibited putting a bike lane between the curb and parked vehicles. The FHWA just recently approved the use of the NACTO Urban Bikeway Design Manual. Its a pretty simple principle. Those cities that do not install very many crosswalks or sidewalks along busy streets will have very few pedestrians. Its very similar for bicycling. Those cities that install more miles of bike lanes, paths and cycle tracks per square mile tend to have more bicycling than cities that have less of these facilities per square mile. New York City, Los Angeles and Chicago are all cash strapped cities. Yet all are putting in cycle tracks. Los Angeles will have its first on-street cycle track this month. The LA council member for that area was willing to take away parking from one side of the street to install the cycle tracks. He’s doing that because he sees it as a way to improve the area by creating a more attractive place to walk, ride a bike and shop. Cycle tracks and bike lanes not only attract more bicyclists, its also been shown to be good for business. Cycle tracks next to the curb tends to create a more open and inviting place for pedestrians. A place more people want to visit and shop. Cars don’t go window shopping. Cars don’t go to pick up a sandwich. People do. In fact, cars are lousy customers except for places that sell cars or service them. Its usually much easier to stop and visit most stores along a busy street if you are walking by or riding a bicycle compared to trying to find a parking space on the street for your car. Indianapolis didn’t emphasis that building their Cultural Trail was also a way to improve the pedestrian and cycling conditions for transportation. The city built it to spur development in a rundown section of downtown. There wasn’t the money for that in the city finances. Still, they got it built through federal money and private donations. I’ve had five collisions with motor vehicles while riding a bicycle. One was when I was in grade school. I was daydreaming while riding my bike on a residential street and rode into the back of parked car. Two were from getting hit from behind while riding in the middle of a motor vehicle lane. One was from a car making a right turn into a driveway while I was riding in a bike lane. I ran into the car’s rear quarter panel. I could have prevented that by paying more attention to my surroundings and slowing down as I approached the shopping mall driveway. Could a similar collision have taken place if I was reaching the far side of a intersection while riding in the middle of a motor vehicle lane? Yes, a motorist could pull out in front of me while they are making a right turn from a cross street. The last collision occurred when a parked car door clipped the front edge of my rear pannier. I did not fall over. What happened was that I pulled closer to the parked vehicles than I usually do when I heard a motorist screeching their tires loudly while accelerating very fast. I’d rather take my chances with the parked car doors opening up than get in the way of someone that wants to go as quickly as they can down the street in their car. Per mile bicycled, by far the greatest rate of motor vehicle collisions for me was while riding in the middle of a motor vehicle lane. Your recommendation will no doubt be to ride more in the middle of motor vehicle lanes to reduce the possibility of right turn collisions and running into parked vehicle doors. That would be ignoring that much higher rate of collisions per mile while riding in the middle of motor vehicle lanes. Once, while I was walking down a winding street at night on a hill in Los Angeles, I could hear someone quickly approaching who was racing his car down the street I was on. I quickly jump behind the curb to try and keep out of the way. Your recommendation would probably be to get into the middle of the narrow lane and wave my arms. That would be a sure fire way to stop the motorist from hitting me. If vehicular cycling is not a cult, please name several disadvantages to riding in the middle of motor vehicle lanes on busy streets. Name one city on this planet where people have a choice in types of transportation and they choose in great numbers to routinely ride a bicycle in front of private motor vehicles on major roads. That idea has never been demonstrated to have any appeal beyond a tiny fraction of one percent of the adult population. Bike lanes are much more successful. That has been shown to attract up to seven percent of the adult population from both the three survey results and studies of large U.S. cities where the miles of bike lanes per square mile versus bicycle commuting mode share were analyzed. If that holds true for Los Angeles, there should be another increase of two to three tenths of one-percent of commuters who primarily bicycle to work in the next two to three Census Bureau household survey results. That’s just from the bicycle lanes that were installed through 2014. The goal that the Mayor of Los Angeles has made is to install 10 miles of cycle tracks this year. There is a dedicated funding source to keep doing that many miles per year. That could increase if voters approve another half-cent sales tax measure for LA county in the next presidential election in 2016. New York City has a goal of installing 5 miles of cycle tracks per year. The have installed 35 miles since mid 2007. By the end of this year, Chicago will have installed 100 miles of buffered bike lanes and cycle tracks in the last four years. There is no miracle in that. Its a growing interest by cities to install cycle tracks. More and more cities are doing just that. The modern cycle track began in the U.S. in 2007 when NYC installed the first parking protected cycle track. In 2006 there were 14 U.S. cities that had cycle tracks. Now there are 61 and its growing. An example of the effect of installing bike lanes and cycle tracks is San Francisco. This Streetsblog article has a tweet down below by Laura J. Nelsen who writes on transportation issues for the Los Angeles Times. As she states in her tweet she’s seeing a flood of cyclists during commute hours. San Francisco has three times the bicycle commute share that Los Angeles has. The San Francisco bicycle commute share is the same as the pedestrian commute share in Los Angeles at 3.6%. The Census Bureau house hold survey results show that people spend on average 30 minutes to commute to work by driving, 20 minutes by bicycling and 10 minutes by walking. A person on a bicycle can cover several times the distance of walking in 10 minutes when they ride a bike for 20 minutes. Los Angeles could certainly match or beat the 3.6% commute share for pedestrians. San Francisco has significantly more miles of bike lanes and paths per square mile than Los Angeles has. “What’s obvious is that the motorist stopped their car from hitting the cycling instructor by pressing on the brake pedal.” Yep, that’s how cars work, all right! They also have steering wheels, and sometimes the drivers have to use those, too. 😉 Driver’s education teaches how to operate those controls. And whatever fairy-tale segregation you propose at that location would have to be repeated, with like-it-or-not custom design, at every other intersection in America. So what will be the national expenditure for these facilities? What will be the national deadline? Alternately, you could work on things like cyclist education, motorist education, reducing speed limits, stricter liability laws, traffic calming, parallel bicycle boulevards, education of police, etc. IOW, you could stop being such a Johnny One Note – especially since the education, at least, will _always_ be necessary, and it would provide immediate (not pie-in-the-sky) benefits. Now, about your personal crashes: OK, you ran into a parked car. I’ve never run into anything that way, but I’ll admit, not running into parked cars isn’t heavily covered in cycling classes. OTOH, road hazards (potholes, slots, etc.) are emphasized, and most people looking for potholes probably would recognize a car in their way. Oddly, I’ve never been doored, because I don’t ride within reach of car doors. You were right hooked while riding at the right. Oddly, I’ve never been right hooked. I’ve definitely prevented hooks by being centered in my lane. You say you were twice hit from behind while riding in the middle of a lane. Oddly, I’ve never been hit while riding in the middle of a lane. I still want more detail on your two such incidents – like, lane width, traffic speed, your position in the lane, intersection or mid-block, etc. I’m also curious about your injuries and bike damage as a result of those two crashes. Care to tell us more, instead of hiding the details? Let’s remember that San Francisco bike use soared during the time when an injunction prevented ANY bike facilities from being built! IOW, fashion is unpredictable. We’ll see how this goes. Are you betting that SF or LA will see over 10% bike mode share in ten years? That there will be “protected” bike tracks all over town? That nobody will need to know how to ride a bike where motor vehicles are present, because anyone 8 to 80 will be able to bumble along through door zones in perfect safety? That the bicycling will remove the traffic jams and air pollution? What exactly is your utopia going to look like, and when? Like it or not, the vast majority of people cycling on a street in mixed traffic will do so in the so-called door zone. Install bike lanes and there will be more people riding in the door-zone. Trying to frighten them by all the potential conflicts that you can dream up, telling them their incompetent and that riding in front of motor vehicles on major streets will empower them has not increased the rate of bicycling. If anything its decreased the amount of bicycling because the vast majority of people do not want to ride in mixed traffic. They feel much more empowered riding in a 3,000 pound, 200-hp motor vehicle than they do with the thought of being exposed to mixed traffic while riding a bicycle on a major street. Few people would ever choose to ride on a major street is in front of moving motor vehicles. You cannot force people to ride where they do not want to. Your insisting that people ride in mixed traffic on major streets or don’t ride there at all. Well, alright then, they are choosing to not ride at all give that choice. Oddly, you point out how cost prohibitive it would be to put in bicycle specific traffic signals at every major intersection and to built cycle tracks throughout cities. Yet, this country has spent trillions of dollars building out the road, highway and freeway system for automobiles and also has installed traffic signals for cars wherever major streets intersect. Cyclist education, motorist education, reducing speed limits, stricter liability laws, traffic calming, parallel bicycle boulevards, education of police are all happening concurrently with putting in bike lanes and cycle tracks in Los Angeles. Just because you are not aware of this happening across the country does not mean that it is not occurring. The only people that are Johnny One Note are those that are insisting that vehicular cycling is the only way to ride a bicycle along a major corridor. San Francisco is spending $55 million on bicycling over two years to try and meet their goal of a cycling rate of 10% by 2018. That’s not a fairy tale, its real, and its happening right now. You and other vehicular cycling advocates describe a perfect world where no conflicts occur when you ride in front of motorist on major roads. Only a small child would buy into that fantasy world. Most adults are aware that on major streets where large mass objects moving at a high rate of speed, that are operated by humans, are where vulnerable cyclists and pedestrians could get seriously injured or killed. It takes a enormous amount of time and effort to try and convince just a few people that bicycling in front of motor vehicles on a major street is the way to go. That idea hasn’t been shown to have a great deal of success. Its literally going nowhere in terms of getting significantly more people to ride on major streets. San Francisco is spending $55 million over two years on bicycling in an effort to meet their goal of obtaining a 10% bicycle mode share by 2018. That’s quite a fashion statement. You keep describing people who choose to ride in any manner other than the vehicular cycling way as incompetent, bumbling, scared, uneducated and not very bright. That’s a sure fire way to win the hearts and minds of people by attacking them. You also ignore the fact that the most successful places for getting the greatest amount of people to bicycle tend to be where there is a great deal of separation for bicyclists. In Japan, which has a large bicycling mode share, there isn’t much bicycle specific on-street infrastructure. What they do is mainly ride on the sidewalks along major streets. Similarly, Los Angeles has a high percentage of the bicyclists who are traveling along major streets, where there is no bicycle specific infrastructure, tend to ride on the sidewalk. Installation of bike lanes on average have doubled the amount of bicycling where they were installed in Los Angeles. Build it and they will come has proven true in LA for bike lanes. Hmm. You’re quite a bit more clueless than I thought! Even the NACTO guide has at least 20 different warnings about door zones and dooring. It advocates buffers between bike lanes and parked cars to help prevent dooring, so they seem to have “dreamed up” the same hazards I have. Perhaps that’s because they are aware of the frequency of dooring crashes in cities – something amazingly beyond your knowledge, despite having been doored yourself! And yes, the country has spent trillions on accommodations for motor vehicles. That’s quite logical, because the overwhelming popularity of motor vehicle traffic allows (in fact, demands) such expenditure. It’s ludicrous to envision even 1/100th the effort and expenditure for an activity which is important to such a tiny percentage of Americans. That’s particularly true in a “No new taxes” environment, and it’s also true since many to whom cycling _is_ important are already doing very well, thank you, with the existing infrastructure. in fact, many others _could_ do just as well after (say) reading a book or two, and/or taking a brief course. I understand you’re not interested in learning. Not everyone will be. There are always those who cherish ignorance, abhor self-improvement and want the government to fix their problems for them. But I’m _so_ glad that I and my family learned to ride properly and confidently! It was really quite easy, and it allowed us to spend decades riding for fun, for utility, for commuting, for vacations. We were able to tour in England, Scotland, Ireland, several countries in mainland Europe, and in quite a few places in the U.S., including riding coast to coast. Even as an old retired guy, I can still ride anywhere I want, with no need to seek out segregated facilities or (much worse) wait and hope for them to be built! Good luck with your Quixotic quest. Let me know when LA hits an honest 10% bike mode share, OK? No, I said “fashion is unpredictable.” I know you have problems with spelling, but at least quote me accurately. Try copy and paste on the hard words. BTW, are you going to give the details on your crashes where you were purportedly hit from behind while in the center of the lane? Your absolutely clueless that the greatest danger of serious injury or a fatality for a cyclist is getting hit by a large mass motor vehicle that is traveling at a high rate of speed. Since very few cyclists are brave or foolish enough to get in front of fast moving vehicles, your astounding conclusion is that this is therefore the safest place to ride a bicycle on a busy street. That’s not based on any data, just hunches, speculation and a few anecdotal cases. Riding surrounded by fast moving motor vehicles increases the amount of potential conflicts with them. Its quite simple. If you are in line with the direction of travel of motor vehicles moving at a high rate of speed, then you are more likely to get hit by one of them. When a projectile that is potentially lethal to a vulnerable human body is being hurled down a road, the last thing that most people want to do is get in its way. Your depending on the human being that is in control of the vehicle to always follow the rules and not make mistakes. The vast majority of people are not willing to put their lives into the hands of other people like you are. I have read it. Your flat out making that up. Increases bicyclist comfort and confidence on busy streets. Creates separation between bicyclists and automobiles. Increases predictability of bicyclist and motorist positioning and interaction. Increases total capacities of streets carrying mixed bicycle and motor vehicle traffic. Visually reminds motorists of bicyclists’ right to the street. Bike lanes are most helpful on streets with ? 3,000 motor vehicle average daily traffic. Bike lanes are most helpful on streets with a posted speed ? 25 mph. On streets with high transit vehicle volume. On streets with high traffic volume, regular truck traffic, high parking turnover, or speed limit > 35 mph, consider treatments that provide greater separation between bicycles and motor traffic. Vehicular Cycling advocates try to develop exaggerated over the top hysteria about the dangers of parked car doors and right turns. Stating your playing Russian Roulette by riding next to parked cars, right turn only lanes are coffin corners, etc. Yet you have the audacity to state that you would have to live thousands of years before you would get killed by a motor vehicle while riding a bicycle in America. I’ve never indicated in any way that LA would reach a 10% bicycle mode share. You seem to have a need to present on-street bicycle infrastructure in terms of all or nothing. If its not done in a way that will reduce the potential conflicts with motor vehicles to almost zero then it shouldn’t be installed. If the mode share for bicycling is not at least 10%, then don’t bother installing any on-street bicycle infrastructure. The fact that vehicular cycling techniques put cyclists in situations where they are surrounded by potential conflicts with motorists on busy roads is completely ignored. Oh, that would never happen, because your obeying the rules of the road and are using hand signals. Its as if your trying to convince people that they are living in some Disneyland Park fantasy world where vehicular cycling techniques empower them to control the behavior of all drivers. Vehicular cycling proponents seem willing to try any tactic to stop the installation of on-street bicycle infrastructure, that all of the curb-to-curb space should be devoted to motor vehicles. Also that bicycles should share that space with motor vehicles traveling at a high rate of speed. In doing that vehicular cyclists are also trying to preventing most people from using a bicycle as a everyday means of transportation because less than half of one percent of the adult population are willing to ride on a major street without some sort of separation from motor vehicles. Cities are trying to build bridges over the raging water. Your saying no need for that, just teach people different swimming techniques. For decades vehicular cycling advocates have been able to infiltrate government boards that oversee bicycling rules. They have been able to prevent most on-street bicycle infrastructure from being approved. The FHWA approval of the NACTO Urban Bikeway Design Guide is opening up the floodgates for cities to use more techniques and designs for on-street bikeways. Thereby bypassing the suburban and rural viewpoint of bicycling governed by antiquated rules. That was an obvious typing error. I’m still waiting for any of the vehicular cycling advocates to produce data that indicates there is less risk for serious injury or death per mile cycled riding in front of motor vehicles compared to riding to the right of them. 🙂 Oh, it was an obvious typing error, just like all the rest of your spelling errors? Oh well, never mind. Among the _many_ things you don’t understand about vehicular cycling is that vehicular cyclists do ride to the right of motor vehicles, when it’s safe to do so. Less knowledgeable cyclists ride to the right of motor vehicles whether it’s safe or not, despite legal permission to be further left. You provided the example, by actually advocated riding in door zones. (And by somehow lacking the reading ability and/or the web search capability to find even NACTO’s cautions about door zones!). You continually portray vehicular cycling as being nothing more than riding a bike in front of high speed auto traffic. You understand less than one percent of it, but continue to post from a position of near-total ignorance. The data comes from John Pucher, “Cycling for Everyone: Lessons from Europe.” In figure 3, Pucher claims the U.S. averages 5.8 fatalities per 100 million kilometers cycled. Converting the units shows that equals 10.71 million miles ridden between fatalities, on average. How many miles do _you_ do in a year? 3000? (2000 is considered very respectable by most cyclists.) 10.71 million miles divided by 3000 miles per year yields 3570 years of cycling before reaching a 50/50 probability of death by bike crash. Is there any part of that data or probability that you don’t understand? Now how about those purported lane centered, hit from behind crashes of yours? Why are you avoiding giving us the details? If being in front of cars is so terribly dangerous, I’d think you’d want to explain your horrifying experiences with it. The vast majority of cyclists who ride on major streets ride to the right of moving motor vehicles. Its very likely then that most of the bicycling fatalities would involve riding in that manner. You’ve very clearly stated that it would take 3,570 years of cycling before reaching a 50/50 probability of death in a cycling collision. Therefore, its very safe riding to the right of moving motor vehicles. This data also indicates that the vehicular cycling community is greatly exaggerating the risk of a fatality when riding to the right of moving motor vehicles and next to parked vehicles. There is no data that I’m aware of that indicates cycling in the middle of a motor vehicle lane on a major street involves less risk of serious injury or death for a cyclist compared to the risk involved when riding to the right–which clearly involves a low probability of a fatality for a cyclist from the data that you referenced. I’ve never indicated that getting hit from behind was a horrific experience or terrifying. Your again jumping to conclusions as you have repeatedly shown you are prone to do. You don’t seem to grasp that a bicycle rider may have the same rights to follow the rules of the road as does a motor vehicle operator, but a bicycle rider does not have the acceleration, stopping ability, nor physical protection afforded occupants of automobiles. There is usually no need to position a cyclist where they do not have the homogeneity of mass and speed with motor vehicles. Riding in the middle of a motor vehicle lane on a major street is not a forgiving environment either physically or socially for most people who would consider cycling. Its very stressful and requires a high degree of traffic tolerance. I’ll go through the circumstances of the two rear end collisions that I had with motor vehicles while cycling only to show you how idiotic the idea is that you can almost completely control the behavior of motorists. One of these collisions involves waiting at a red light on a major street. A motorist pulled up directly behind me, stopped and we both waited for perhaps a minute for the light to turn green. I proceeded to start to pedal and the motorist ran over my back wheel. Clearly, she knew I was there, she saw me directly in front of her and yet still ran over my back wheel. It was a error in judgement on her part. The second rear end collision that I had involved a motorist that was coming around a curve of a freeway off ramp that had no stop sign or traffic signal before it continued onto the street. I had moved over into the center of the far right street lane that the freeway off ramp continued into. The motorist looked to her left to try and merge into the next lane and struck me from behind on the front left half of her car. I slid with my head under her front bumper. In this case the motor vehicle was traveling straight while the motorist was looking to the left. Here’s video example of what can occur when there is not a homogeneity of mass and speed when mixing motor vehicles with bicycles. Several winding hillside roads in Los Angeles are notorious for people to take the turns at a very high rate of speed with their motorcycles or cars. In fact many of the motorcycle riders are wearing the type of clothing that would be used on a motorcycle racing circuit. In this particular case its Mulholland Dr. where people take videos of people driving at high speeds around corners. Vehicular cycling techniques of riding in the middle of a narrow lane road like this would not be advised. In this case the cyclists were riding to the edge of the road. But if they were riding uphill in the middle of the lane and a motorcycle rider or motorist came around a corner at a high speed the motorist would probably would not be able to stop quick enough to prevent a collision. Motorists who travel in the hills in the Los Angeles area do not expect anything to be traveling at a fraction of their speed directly in front of them. 10.71 million miles of riding between fatalities. That’s the average for Americans, according to cycling advocate John Pucher (who somehow still claims it’s “dangerous”). So that includes _all_ types of cycling – the drunken, wrong-way, no-lights, wobbling home from the bar crowd; the no-brakes fixie blast-past-red-light hipster crowd; the gonzo-downhill-rocky-trails mountain bike crowd. And yes, the gutter-bunny, skulk in the door zone crowd. That does not mean that all types of riding are equally safe, any more than all types of driving are equally safe. On today’s freeway drive, I watched a jerk driving probably 25 mph faster than all other traffic, weaving through tight spaces to change between all three lanes. Would you say his stupidity was fine, because driving is safe on average? To put it another way, door zone or gutter riders’ dangers are probably hidden in the data. Most door zone riders will certainly survive, just as today’s freeway jerk survived. But neither behavior is to be recommended. Just ask NACTO. Now, about your crashes: The first thing to point out is that they are _very_ unusual. I’ve been very active in a large bike club for 35 years, and nothing similar has happened to anyone I know. I regularly ride past a similar freeway ramp half a mile from my house. Yes, it requires attention, but I’ve never had problems. So what do I do that you did not? Is there perhaps something you can learn? Yes, I know: Of _course_ there’s nothing to learn! Because bicycling should not involve learning, right? Of _course_ the only solution is some sort of a cycletrack at that freeway ramp, right? So, let’s hear how you would redesign the ramp intersection. And how much the redesign and rebuild would cost. And how many intersections in just your county will need the treatment. And how you’ll convince the county (or whomever) to finance the huge project. And how soon you’ll extend the project to all the other roads with different intersection types. And most important, what the local cyclists should do until just _those_ intersections are complete. About the video: Yes, I’ve seen it. It’s made the rounds specifically because it’s so unusual, and it takes place on a road famous for motorcyclists’ extreme speeds. It’s hardly typical. And note, please, the cyclist that got hit was _not_ in the middle of the lane. Still, there are lots of rural roads that look sort of like that. We used lots of them (plus lots busier ones) to ride coast to coast, with zero problems. So: Should cyclists stay off _all_ similar roads until your cycletracks are built everywhere? Would it not be better to educate cyclists and motorists, institute better driving enforcement, implement strict liability rules, etc? Just until your fairyland arrives, that is. Cyclists getting right-hooked or running into parked vehicle doors are only a fraction of both the overall reported bicycle/motor vehicle collisions and the cycling fatalities. You’ve very clearly stated that it would take 3,570 years of cycling before reaching a 50/50 probability of death in a cycling collision. Looking at just the right-hook and parked vehicle fatalities for cycling, the years would therefore be much greater than 3,570 before a probability of a cycling collision fatality would occur. “Would it not be better to educate cyclists and motorists, institute better driving enforcement, implement strict liability rules, etc?” Cities are working on this concurrently with installing bike lanes, cycle tracks, bicycle boulevards, more bicycle parking, bicycle sharing, Ciclovia events, etc. Let’s look at actual data to see if putting in bicycle infrastructure is really just a fairy tale or a fashion. The Bicycle League of America made a survey of miles of bike paths and bike lanes installed in the 90 largest U.S. cities in 2009. Dallas, pop. 1,299,590, had zero miles of bike lanes in 2009. By October 13th, 2014 the city had installed 16+ miles of bike lanes and another 55 miles were in the works. Indianapolis had 20 miles of bike lanes in 2009 and now has over 100 miles. Memphis had 2 miles of bike lanes in 2009, it now has added 35 miles of bike lanes in only two years. Detroit had 7 miles of bike lanes in 2009, it now has over 68 miles of bike lanes. San Antonio had 13 miles of bike lanes in 2008, this had grown to 242 miles by 2012. The miles of bike lanes and cycle tracks installed in large U.S. cities is growing. That’s not a fantasy, its reality. People have shown very little interest in following the extreme ideas of Cycling Savvy or other vehicular cycling training courses. That ideology has very little potential to gain much traction among the populous. I can’t remember the last time I saw a person ride a bicycle in a gutter pan. Its extremely rare in the Los Angeles area and I’ve found it difficult to do for any length of time. Labeling people who don’t follow the vehicular cycling principles as gutter bunnies and skulking in the door zone is an extreme exaggeration and distortion of how most people ride on a major street. Ah, data! You mention a little over 500 miles of bike lanes – but you’re not mention the propaganda claiming that ordinary bike lanes are not sufficient, that until we get “protected” cycletracks, we’re not doing things right. Of course, I’m sure there are more than 500 miles of bike lanes in the U.S. What’s your guess? 1000? 5000? But supposedly, there really are barely over 500 miles of protected cycle tracks. As you say, “The miles of bike lanes and cycle tracks installed in large U.S. cities is growing. That’s not a fantasy, its reality.” Trouble is, “growing” means relatively little when you’re starting from damned near zero. The NON-fantasy is that the U.S. has roughly for MILLION miles of streets and roads. So your inadequate, ordinary bike lanes may amount to just ONE PERCENT of streets. And your “growing” cycletracks are roughly 0.01% of American streets or roads. Not 1%! Just a hundredth of a percent! So if you continue to claim that people will not ride if they have to share the road with motor vehicles, you’d better get cracking to “fix” the other 99.99% of the nations streets or roads, so people can actually ride bikes. Alternately, you can actually start the less expensive tactics that have never been energetically tried, the ones I’ve previously mentioned: Education of cyclists; education of motorists; traffic calming; bike boulevards; traffic calming; education of police; enforcement of speed limits; enforcement of minimum passing clearance laws; useful shortcut bike paths between neighborhoods and traffic generators; publicity campaigns; strict liability laws. And if you want to get into your “fairyland” dreams, do the _other_ things that Amsterdam, etc. already do in _addition_ to cycletracks: much higher gas prices, much higher fees and education requirements for driver’s licenses; much higher taxes on car purchases; very hard-to-find parking; car-free zones; road blocks positioned to make motorists’ trips far longer than bike trips; woonerfs, or super-low-speed residential areas; dedicated signal phases for cyclists; very high city densities; workplaces far closer to homes, on average; fantastic public transit. Oh, and level terrain, mild climate, and a 100 year history of using bikes for transportation. Get cracking, Dennis! If you stop being such a fairy tale believer, you’ll see there’s PLENTY of work for you to do! Heck, even if you don’t stop with the fairy tales, you’ve got a lot to do. 99.99% of America is still waiting for your solution. So – how soon? Got a date? OK, fine. Cite me a real study by people with real expertise in traffic engineering. Your cited study: http://www.johnforester.com/Articles/Facilities/Infrastructure%20&%20Injuries.pdf is telling you what you want to hear, but hasn’t a sound foundation to tell you that. Expensive bicycle-“friendly”* facilities aren’t free either. You are paying for them, dearly. And you aren’t getting your money’s worth. Those who use the more-friendly facilities would likely beg to differ with your assessment. Even the small sample of studies I linked above were performed by NYCDOT, KOA Corporation traffic planning/engineering, City of Long Beach Traffic And Transportation Bureau, Chicago DOT, among others, which all had to prepare detailed before/after technical reports for the FHWA. In other words, large numbers of people with “real expertise in traffic engineering” were directly behind these studies and others. Expensive bicycle-“friendly”* facilities aren’t free either. Depends on what we mean by “expensive.” Many times, especially a parking-protected bike lane may be as simple as reversing the order of the paint. But waiting for a gap is bowing to the dominance of motordom. I fail to see how that is superior to just turning onto a cycletrack and continuing on without having to wait. I wait for gaps while driving my car too. Your magic cycletrack isn’t saving me from right hooks, pullouts or left crosses. In fact it tends to make those higher risk, especially for anyone who rides at 15mph or more. In fact it tends to make those higher risk, especially for anyone who rides at 15mph or more. Your magic cycletrack isn’t saving me from right hooks, pullouts or left crosses. Good design and higher modeshare significantly reduce these risks. What if American society chooses to accept that cost – it could be called an investment – to be like the Dutch environment? Or more likely, what if some communities committed to making cycling accessible to everyone, regardless of how fast they can ride a bike, chose to make that investment? It’s happening as we speak – why fight it when one could instead push for sound designs, like the Dutch have? Odd example, that. In much of the Netherlands, the cycle paths are mandatory–the “racing” cyclists couldn’t use the road if they rather would. Perhaps these very riders rather would!